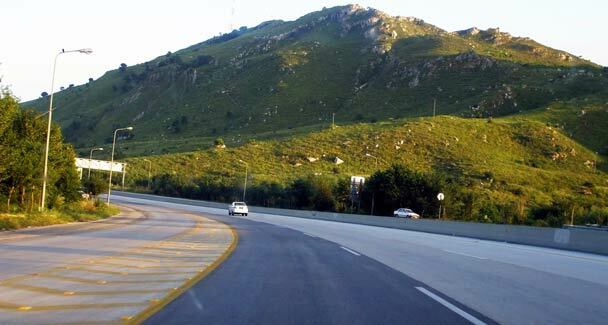 ISLAMABAD: If you want a slice of peace and stability in a country with a reputation for violence and chaos, try Pakistan’s M2 motorway. And this is Pakistan, for many a ‘failed state.’ Here, blandness can inspire almost heady optimism. Built in the 1990s at a cost of around $1 billion, the 228-mile motorway — which continues to Peshawar as the M1 — is like a six-lane highway to paradise in a country that usually makes headlines for suicide bombers, army offensives and political mayhem. It puts paid to what’s on offer in Pakistan’s traditional foe and emerging economic giant India, where village culture stubbornly refuses to cede to even the most modern motorways, making them battlegrounds of rickshaws, lorries and cows. There are many things in Pakistan that don’t get into the news. Daily life, for one. Pakistani hospitality to strangers, foreigners like myself included, is another. The M2 is another sign that all is not what it appears in Pakistan, that much lies hidden behind the bad news. On a recent M2 trip, my driver whizzed along but kept his speedometer firmly placed on the speed limit. Here in this South Asian Alice’s Wonderland, the special highway police are considered incorruptible. The motorway is so empty one wonders if it really cuts through one of the region’s most populated regions. ‘130, OK, but 131 is a fine,’ said the driver, Noshad Khan. ‘The police have cameras,’ he added, almost proudly. His hand waved around in the car, clenched in the form of a gun. I toted my luggage over to the Pakistan side, and within a short time my Pakistani taxi purred along the tarmac. The driver proudly showed off his English and played US rock on FM radio. The announcer even had an American accent. Pakistan, for a moment, receded, and my M2 trip began. On my latest trip, I passed the lonely occasional worker in an orange suit sweeping the edge of the motorway in a seemingly Sisyphean task. A fence keeps out the donkeys and horse-driven carts. Service centres are almost indistinguishable from any service station in the West, aside perhaps from the spotless mosques. The real Pakistan can be seen from the car window, but in the distance. Colourful painted lorries still ply those roads. Dirt poor villagers toil in brick factories, farmers on donkey carts go about their business. Of course, four hours of mundane travel is quite enough. Arriving in Lahore, the road suddenly turns into South Asia once again. Dust seeps through the open car window, endless honks sound, beggars knock on car windows. The driver begins again his daily, dangerous battle for road supremacy. As Pakistan unveils itself in all its vibrancy, it is exciting to be back. But you can’t help feel a tinge of regret at having experienced, briefly, a lost dream. ‘Motorway good — but Pakistan,’ Noshad said at the last petrol station before we entered Lahore.